In recent years I have become increasingly disenchanted with high street clothing. Although I’m no longer constrained by my 3-year wartime rationing experiment, I have struggled to buy replacements for clothes I’ve worn to threads as I simply can’t find garments in a style I like or of an acceptable quality or provenance. By spring this year I concluded that I needed to use my modest dressmaking skills if I was going to restock my wardrobe. I had started to improve my sewing skills five years ago but these efforts stalled during the rationing experiment. A yard of fabric attracted clothes coupons just as ready-to-wear items did. Freed from such considerations I was, however, still wary of cutting into cloth. My strong strain of perfection mingled with my resource awareness and environmental concerns proved a potent force, fuelling some serious procrastination. Six months on I am planning to sew a winter coat. So what changed? Or rather how did I get beyond the paralysing fear of messing up good fabric? The short answer: necessity, an old sheet, an online community… and, perversely, my perfectionism. My summer wardrobe had shrunk to one dress and a poorly fitting denim skirt so I really needed another skirt or two. Encouraged by The Inelegant Horserider’s delight in making a practical well-fitting skirt, I bought the same Amazing Fit pattern (1717, alas now out of print) and made a toile out of an old sheet. 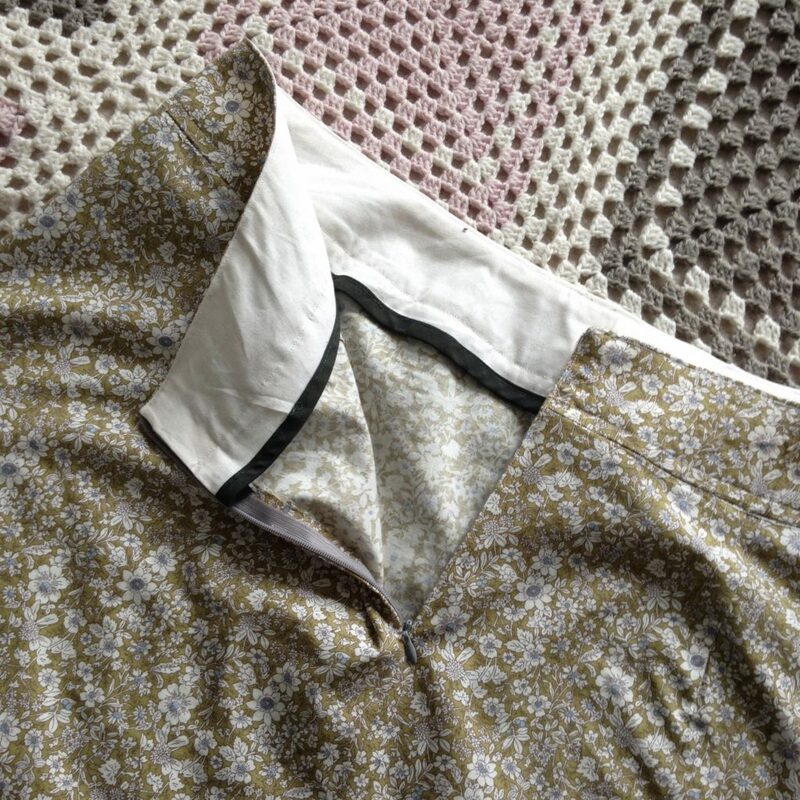 It was a simple A-line skirt, with darts for shaping and a yoked waistband. As the mock-up reassured me that the pattern would fit and was within my skill set, I bought fabric, washed and pressed it and set about cutting out the pieces. A fortnight later I had a summer skirt. Okay, I unpicked the zip three times to get the waist band to align properly, I ended up making my own bias-binding as I hadn’t bought enough and my top stitching wasn’t going to win any prizes but I had a summer skirt that fitted and looked okay. Rather than adventurously looking for another pattern, I used the same one again for a second summer skirt. This time in a plain stone coloured linen. It may have been the same design but the fabric meant the process and finished result were different. For one, I knew which mishaps I wanted to avoid. 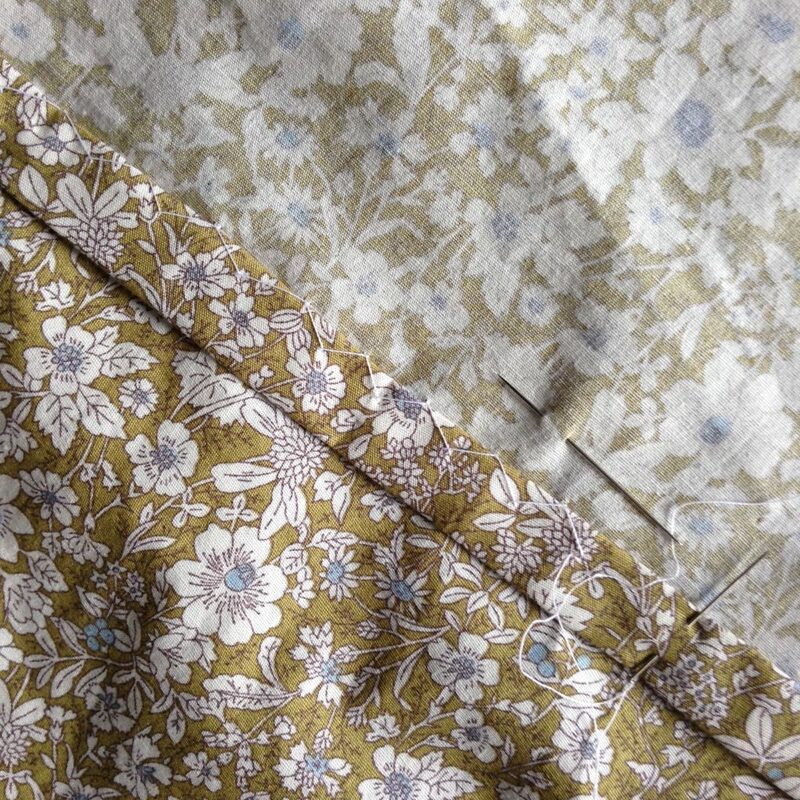 And upon discovering that linen frays badly I also realised I would have to bias bind every seem (in the absence of an overlocker) to ensure a good finish. By garment number two I was already thinking in terms of “I don’t just want this skirt to fit, I want it to be well-made and properly finished”. Since then, I’ve made a smart-ish black skirt with the same pattern (this time lined as I’ve realised that lining really does improve the overall look of clothes), a wearable toile of a pair of trousers, a toile of a dress and a second improved version. And I’m currently copying the pattern for a new winter jacket. After my initial paralysing procrastination, my perfectionist instinct is spurring me on. The aim is not a perfect wardrobe but rather a small wardrobe of well-made, well-finished clothes that work for me. Knowing I am capable of making a garment that fits is empowering, but not half as much as realising that, even with my basic skills, I can produce a better fit and finish than a lot of what’s available off the peg. And, it is rather gratifying to know that I am not the only one who cares about well-aligned waistbands and hand-finished hems! It’s been so inspiring reading this post and also watching your progress in clothes making on Instagram. I’m also on a similar journey as getting older means changes to my body shape, and I don’t want to wear similar clothes to my mother just yet! The only option is to make them. I love how you describes your process. I’m not a perfectionist, I’ll probably redo the zipper twice and then just wear it, arguing that high street clothing also has that flaw. I don’t like tracing a pattern but like to re-use the same several times, adapting a bit here and there and changing the fabric and the look of my skirt. I have become more conscious that I like to buy fabric with prints but if I go to the shop, I’ll chose more neutral colours. 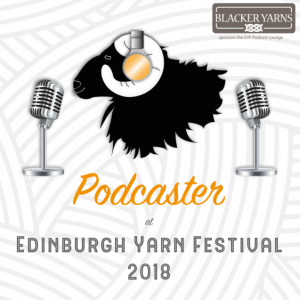 Knitting with black is an issue, sewing with black is a different experience. My challenge is to be able to combine my handmade pieces of clothing. 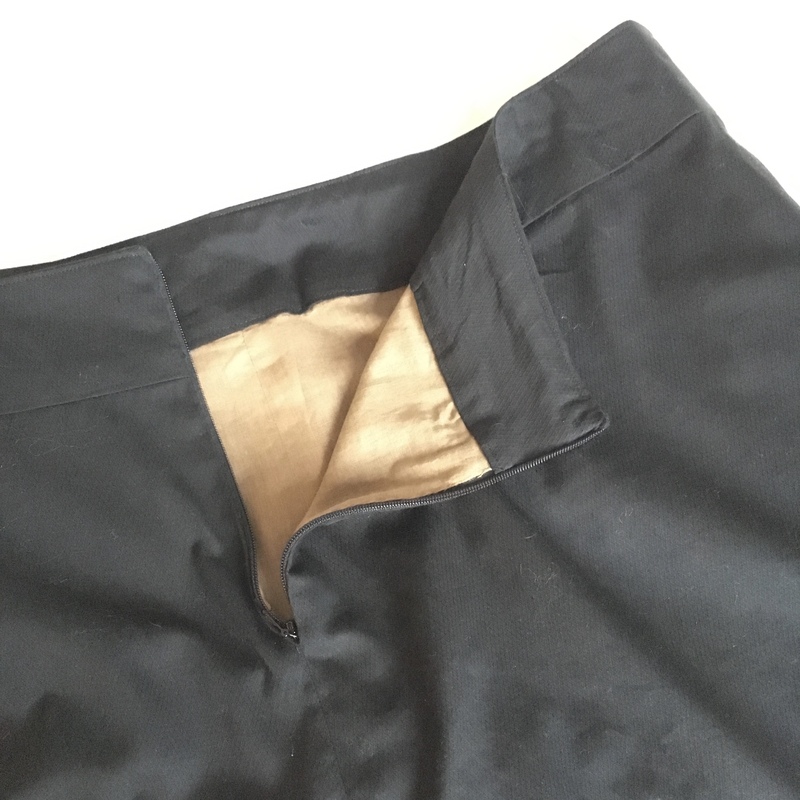 I’m impressed that you’re being such a perfectionist – but I wanted to mention (for anyone who is reading this and just making a few basic skirts, maybe for work) that I don’t bother lining mine: I made a well-fitting (with a zip) A-line slip that is exactly right for all my (A-line) skirts (they’re all the same length: knee) and I can wear this under all of them. Saves on lining material (and time!) and also the fabric is really good non-stick/non-slip – doesn’t hoik up! … which makes all my skirts look better. Then you can wear summery skirts with slip (and tights and boots) too. Keep up the sewing! What type of fabric did you use? I hate the elasticated waists of most slips and generally the fabric used for slips, even anti static ones, so I am well in the market for making my own! I am American and have never heard the term “high street clothing.” Does this translate to clothing which is made well, but is constantly changing fashion to make us buy more? I want to compliment you on your careful work on your new clothes. I love the way you are taking the time to finish the inside seams. Beautiful, and will extend the life of your garment! 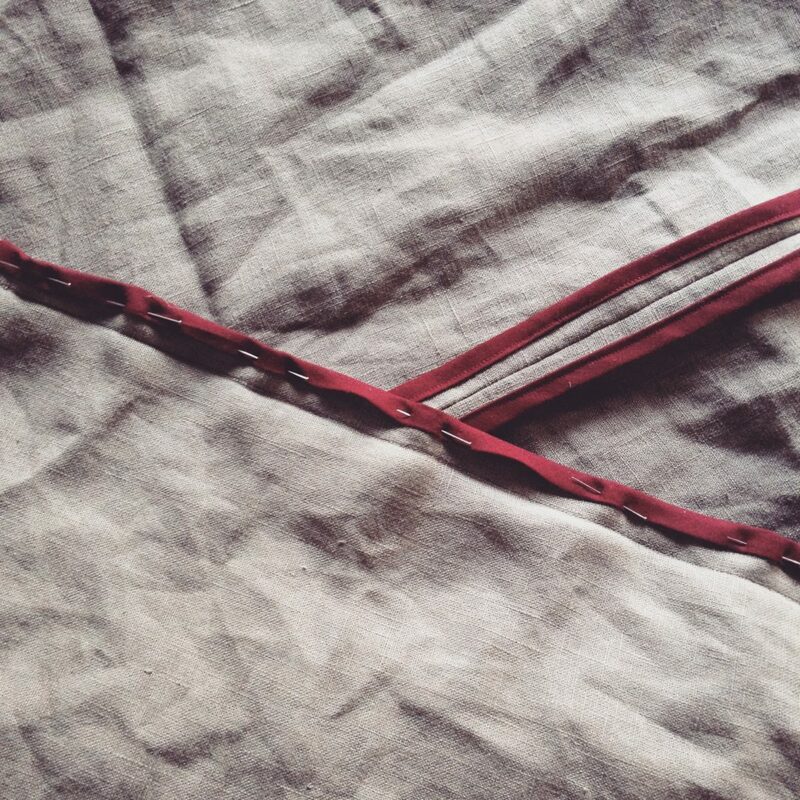 I have spent some time this year perfecting my hand stitching through instructions in an Alabama Chanin book. My 1948 sewing machine probably works, but I will need to relearn so much to get it up and running again. Linda, thank you for popping by and taking the time to comment about taking time to finish my work. I often feel I am a bit slow when I hear so many other bloggers and podcasters can run up four of five outfits per month but I just have to keep reminding myself. I am not sewing to have a vast wardrobe, I want to regain some of the quality that has been lost in recent decades. Also, as strange as it may sound, I actually enjoy the process of hand finishing clothes. Re high street clothing, I guess you may use the term “ready to wear” clothing. I suppose the term is a little archaic these days anyway as so many clothes are bought online now. It dates back to the 20s/30s when more and more of the population bought RTW clothes on the high street rather than making them themselves. Also, in the UK shopping malls are a relatively recent thing, maybe in the last 15-20 years, so the high street was the place where one shopped in a pre-mall, pre-Internet era. I hope that makes sense. I bet your 1948 sewing machine works better than my modern one. I still rue the day when my mum’s 1960s Singer sewing machine died on me!